While EUR is being empowered by the positive economic reports in Euro zone such as Retails Sales in Germany, EURUSD is also under the influence of the US unemployment data and Personal Income report. 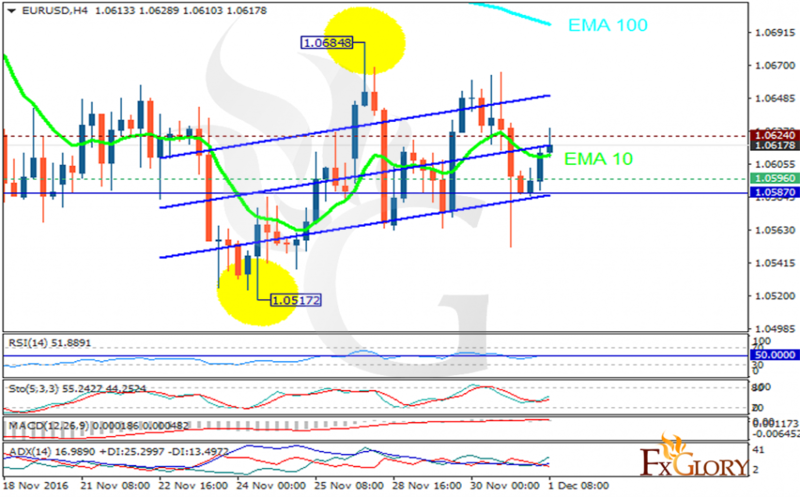 The support rests at 1.05960 with resistance at 1.06240 which both lines are above the weekly pivot point at 1.05870. The EMA of 10 is moving with bullish bias along the ascendant channel and it is below the EMA of 100. The RSI is moving on the 50 level, the Stochastic is showing upward momentum and the MACD indicator is in positive territory. The ADX is showing buy signal. The resistance level breakout will be a good sign for the continuation of the bullish pattern. Buyers can target 1.0700 area.